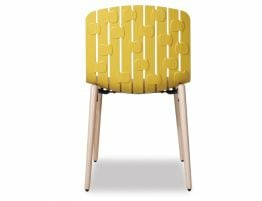 Mustard yellow original Gotcha dining chair by Spanish design team Enrique Del Amo and Angel Marti, is without a comfortable chair. 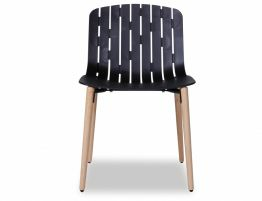 Slightly oversized with an unmistakable back design make this chair a timeless design. 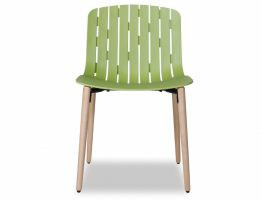 If you like natural tones but need to spice up your eating area, Gotcha in mustard will be the perfect choice. The Gotcha chair design looks incredible in large commercial quantities or just as striking in smaller home settings. 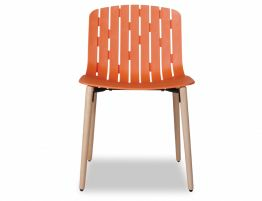 Gotcha café dining chair is stable, well made and just the thing for bustling family kitchens or lively café or restaurant dining rooms. Modernize your commercial dining chairs or refresh your kitchen dining area with the best in modern dining chairs.